Over the past 50 years the U.S. auto industry has faced multiple existential crises, mainly a downward spiral of lost opportunities and lack of innovation. Detroit's market share in the U.S. alone shrunk from a little over 90% in 1965 to less than half of that in half a century. Seems like another, bigger existential threat is about to hit Detroit: driverless and the car-sharing trend. Will the industry face what Frost & Sullivan consultant David Frigstad calls 'the Kodak moment'? "Buying a car could soon be a thing of the past, and Ford is desperate to find what’s next" according to a Washington Post article, published June 24. Electric drive already proved to be a watershed development, the auto industry will really come to a pivotal point with the prospect of 'driverless' and sharing cars rather than owning them. What they have in common is the more conscientious and efficient use of resources (materials, energy, time, infrastructure, the environment). "The new generation is really thinking about how to use transportation in an on-demand way, they are less tied emotionally to the physical vehicle", says Ford's Research & Advanced Engineering VP Ken Washington. This utilitarian attitude towards the car aligns remarkably well with driverless. But it also means that 'outsiders' will take a shot at what's considered the largest consumer industry in the world, and provide the car of the future. That should make the traditional car makers' creative juices flowing. Question is: are they? The car industry faces two major challenges. One: develop a business model no longer solely based on selling cars, and develop new, what I'd like to call, 'automotive formats' that will make people 'crave' again because they have something new and better to offer. Two: make cars drive autonomously. Interestingly, Daimler already has its car-share program. No doubt that lower than expected Smart sales contributed to setting up the Car2Go program (visible in the quadrant's right corner). Automakers need to determine how fast and far the whole self-driving thing will go in terms of technology, politics, legislation, standardization, liability, practicality, mingling with road users that aren't auto-driven * (often overlooked), and consumer acceptance. What's interesting is that the effects can be twofold for the right type of car. Auto-driven cars, used in a shared capacity, may complement, at times even replace public transport. Google's long-term goal is made visible by the red arrow in the green square's upper corner: make the conventional car obsolete as well as rival public transport. Noticed how unassuming, bland, cute its self-driving pod looks? I'm sure nobody would mind sharing one with other people. Not exactly meant to take it out for the proverbial spin (no manual drive), it's by definition not a car to call your own. However, auto-driven cars that have something new to offer when 'driven manually', could also rekindle interest in ownership. And this may go together well with the prospect that drivers will stay responsible for a long time, at least until 2025. 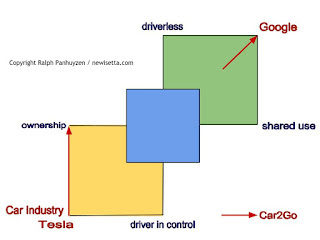 Self-driving cars will have a steering wheel in this 'intermediate phase' (indicated by the blue square). Now there's an intriguing window of opportunity! Why not offer the person behind the steering wheel the conscious choice between relaxing with the auto-pilot switched on, or active involvement in 'manual override mode'? It's why we game, not some robot. Not just any new car will do. It should excel in 'robo-drive' as well as when you are in control. The magic word is reinvent! No better example than Apple's reinvention of the good ol' phone. Its design and functionality turned out to be such a smash hit, that usage and ownership of the Apple iPhone was taken to a whole new level. It turned into a cult, particularly with young people, and made Apple the richest company in the world! Why not do the same to that four-wheeled box that has been around for more than a century? 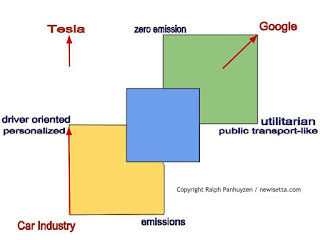 Swap the blue-printed terms in the first quadrant for the terms in the second, and only Tesla 'moves up' with its electric cars. They could never 'qualify' for the blue square though. With a width well above the average driver's length, the Model S squeezes itself through traffic. It's like moving sideways while lying across. Weighing 25-30 times more than the driver, basically all resources go into moving around the 'device' that is supposed to transport who's driving, usually the only occupant. Apple is reportedly working on an i-Car. The young can be, to use Ford Research VP Ken Washington's term, "tied emotionally". 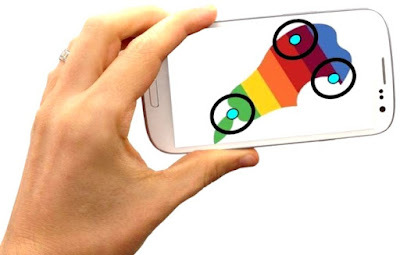 What's needed is a next-generation approach that encompasses all new possibilities, incl. the potential blend-in with public transport. When occupancy rate is high, public transport is efficient. But a bus' or tram's standard bulk and weight do form a handicap at hours when demand is less. One can already envisage a 'jack of all trades on wheels' make its appearance, looking like nothing else that's available, energy-, cost- and space-efficient, maneuverable in dense city traffic, yet comfortable and safe, with excellent ergonomics to make it an early adopter of driverless technology, and offering a new take on driving. It can come in the form of traditional ownership, rent or lease. Use it on a car-share basis, and it can become public transport-like in self-driving mode - what you might call an 'auto-mobile' in the truest sense. Curious how the story ends? Double-click on the green *NEXT* option. * Expert members of the Institute of Electrical and Electronics Engineers (IEEE) estimate that up to 75% of all vehicles will be autonomous by 2040. Ralph Panhuyzen, PhD (Leyden University) has been involved with the scientific study on 'auto-mobility' in the Netherlands (one of the most densely populated countries in the world) which was held under the auspices of the NWO, the Netherlands Organization for Scientific Research. His vision and concept of a new type of vehicle newiSetta.com is partly based on his logistical experiences. As a former managing director of a major multi-modal transportation center for freight, linking terminals for sea ships, inland barges, trucks, trains and warehousing, Panhuyzen is experienced in joint ventures combining public domain interests and private enterprise.